iA Writer 5.2 offers premium Microsoft Word export for markdown and lays the ground for a great iOS GitHub synchronization. iA Writer 5.2 comes with three custom-made, variable writing fonts that are available for download on GitHub. Both iA Writer for Mac and iOS are localized in English, German, Japanese, Chinese, French, Italian, Portuguese and Spanish. For this update, we’ve decided to add a little present: 17 beautiful wallpapers for your desktop, mobile phone, or tablets. To get your localized copy of iA Writer, simply update your apps via App Store for Mac and iOS. iOS and Mac now also come with an updated iA Duospace and an optional dark icon. 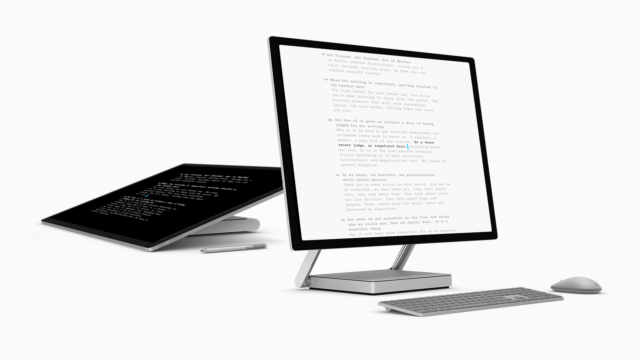 iA Writer for Mac, version 5.0, is now available for download in the Mac App Store. It comes with a brand new document library, and apart from English, German and Japanese, it now also speaks French, Spanish, Chinese, Italian and Portuguese. Favorito, Favorito… We wanted to make file management intuitive and fast. So we added an Organizer panel on the left side of the Library, providing easy access to Library locations and Favorites. We invested a lot of time into finding a way to split the title bar without going too much off course from the Mac OS standards. This update to iA Writer brings support for tabs in macOS High Sierra. Version 4.2 also comes with a subtle UI polish in typography and transitions, all in preparation for the big 5.0 upgrade. Tabs are a subtle and welcome improvement to getting things done in iA Writer. You can now keep all your documents open within the same window, instead of fracturing your focus across multiple. Due to restrictions within Mac OS, tabs work on High Sierra upwards only. 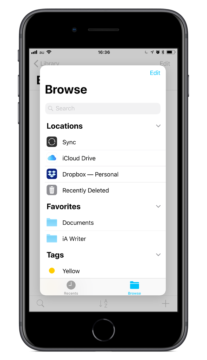 iOS: Backups for Dropbox, Google Drive and Co.
How does sending traffic to the App Store affect your App Store ranking? Sending too much traffic too the App Stores might negatively impact your App Store ranking. To sell as many apps as possible, we send all our traffic to the stores. Recently, some of the numbers left us guessing. The more traffic we send, the higher the sales. But, somehow, our App Store ranking suffers. We constantly test new ways to optimize our sales funnel. The funnel Twitter – Site – App Store is a long, shaky funnel and we don’t get useful data from Apple’s Analytics. Scores of you wrote in wondering when iA Writer 5 for iOS was going to be released. We took our time to get it right. 10 months in the making, we built iA Writer 5 following three specific goals. Through the 10 months of iterations, training our focus on these objectives has kept us on track. So what did we choose as our guiding principles? Everything from the keyboard When you’re writing, you want to stay in front of the keyboard. 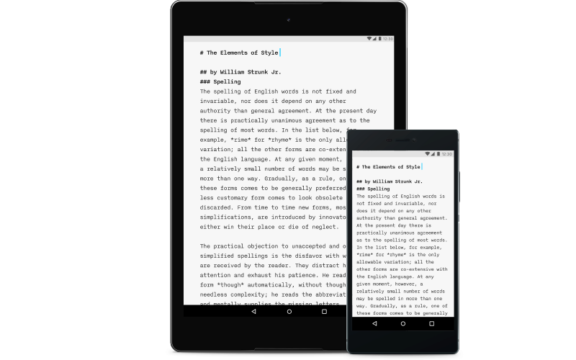 The new iA Writer for Android now works on 42,000 different phones and tablets. Different brands, different resolutions, different processors, screens… Here is how it looks. 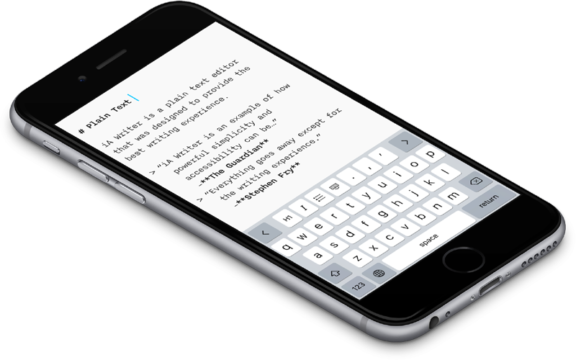 You may have already seen our sneak peek of iA Writer 5 on iPhone. For those of you with iPads, you may be wondering what the tablet experience will be like. This is what you can expect. iA Writer 5 will be released on iOS shortly. 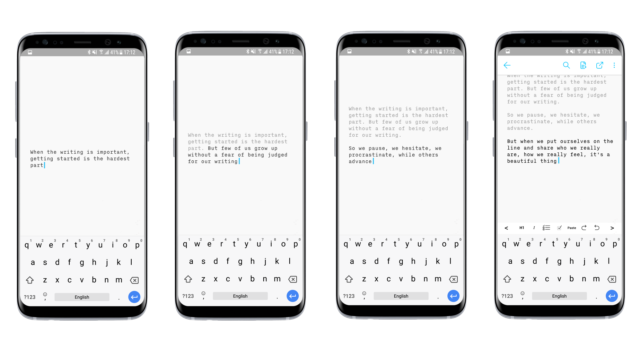 You asked for more focus on the writing, so we directed our attention on the keyboard, the heart of your writing experience. 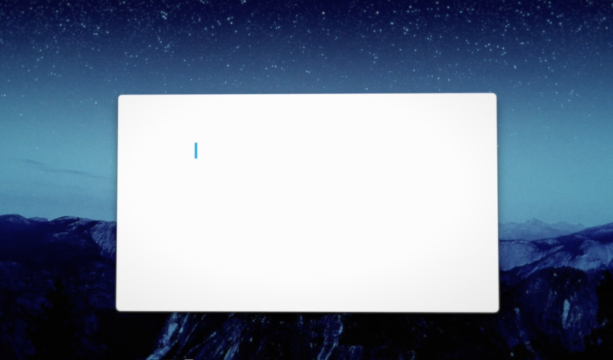 Many of you praised Open Quickly in iA Writer for Mac so we brought it to iOS. We improved it by including actions in the search results—in addition to your files. Create a new file, switch to night mode, export to PDF. You can search for all of them right from the keyboard: You liked our configurable keyboard extension and asked for more freedom. “Only write when you have something to say.” It’s short and sound advice. Like “Think before you speak.” But, how do we know if we have something to say? Something to say to whom? Is there some other way than speaking to find out if we had something to say? Is there a formula? “Only write when you have something to say” almost sounds like writing is for geniuses. Does it have to be the world listening? Last week we explained how we believe that technology evolves from raw to complex to simple and how this relates to iA Writer. In order to simplify it even more, we asked how you see iA Writer in future—and what and how you’d expect to pay for it. To a handful of questions we received a warm wave of response from you. You all agreed on on thing: Let’s keep it simple. Here are some highlights: iA Writer on both iOS and Mac is already pretty close to perfect. Technology evolves from raw to complex to simple. 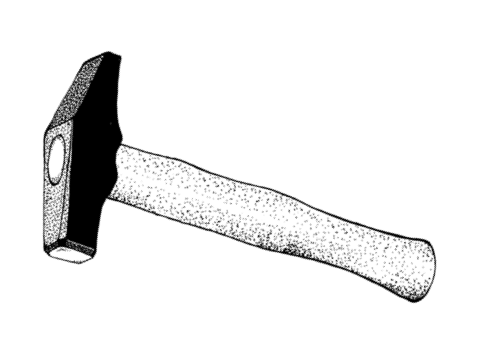 From the fist to the hand axe to the hammer. From carts to the Model T to Tesla. From switchboard-operated phones to digital phones to smartphones. From SMS to Facebook to Messenger. From the crude to the cooked to Sushi. To help you get the most out of iA Writer, we’ve created several videos. Here you can find tips and tricks which make producing beautiful content easy as pie. A year ago, iA Writer for Android entered the Play Store. So far, we have sold a little more than 6,000 apps. At a price of 1 to 5 Dollars, this doesn’t cover much more than one month of app development. So we decided to go free and add in app purchases later. In 2013, iA Writer introduced Syntax Control: syntactic highlighting as an editing feature. We kept it minimal: only one part of speech at a time, in blue. With version 3.1, iA Writer breaks out of its minimalist straitjacket. 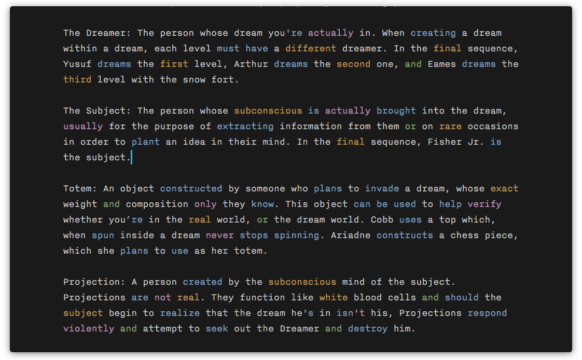 Syntax Control now highlights parts of speech in blue, yellow, orange, purple and green. She’s a rainbow. Five years ago this month we released iA Writer for iPad. We built apps for Mac, iPhone, Android, and a whole new iA Writer Pro branch. People who use iA Writer enjoy the experience of writing with it, they love its purity. We released iA Writer 3, the third generation of our writing machine, as a free upgrade to iA Writer Pro. 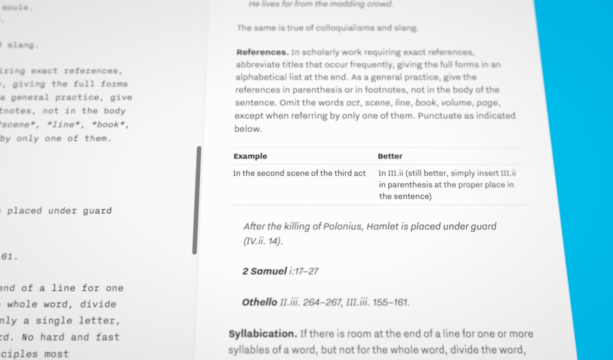 After four years and over 1 million downloads of iA Writer, we’ve introduced something new. 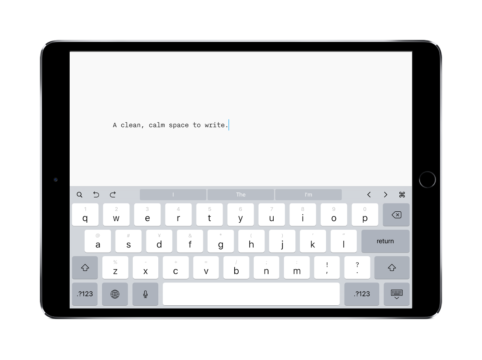 iA Writer Pro is a writing suite that boldly goes where no other writing app has gone before. It's been two weeks since the launch of Writer for Mac and it went off like a rocket. We sold almost 5,000 copies in two weeks. Of course, version 1.0 had some birth defects (1.01 is out now), but the feedback was overwhelmingly positive—with the exception of a few complaints, mostly about the absence of features, and the price. A better tool doesn’t make a better craftsman, but a good tool makes working a pleasure. 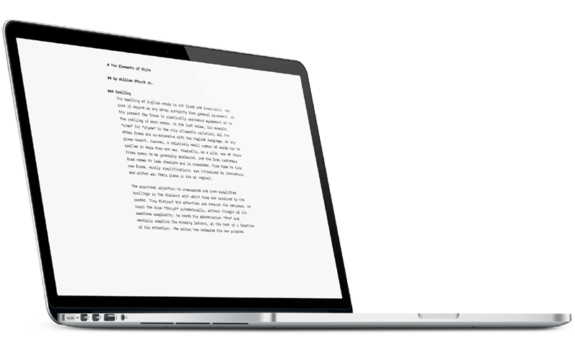 iA Writer for Mac is a digital writing tool that makes sure that all your concentration goes into the text instead of the program. I wasn’t expecting this. In three weeks, we’ve sold over 13,000 apps and every day we seem to climb up another rung in the App Store. While selling apps makes the product feel real and secures future development, the biggest personal satisfaction comes from the feedback our app gets from professional writers.